efforts in the PNG Highlands. MORE combined training of soldiers from Papua New Guinea and New Zealand are expected after an agreement was signed by the two countries yesterday. PNG and NZ signed a Status of Force Agreement (Sofa) to enable ongoing military cooperation. NZ Minister for Defence Ron Mark said at Murray Barracks in Port Moresby that their relationship with the PNGDF was one of the “strongest and most active” in the South Pacific region. “Our respective forces have a high level of engagement and mutual understanding anchored in training together, exercising together and cooperating over many decades,” he said. Mark said those engagements had “developed deep respect, trust and their strong people-to-people links were based on a mutual willingness to send personnel to each other’s lands to participate in training, exercises and leadership development. He said the two countries had been engaging in exercises and activities for decades and the signing of the agreement would see a continuation of their bilateral partnership. “This agreement is a mark of how strong our relationship is and records our mutual desire for an ongoing and close defence relationship,” Mark said. said the agreement was another milestone for the PNGDF in signifying the increase in military programmes and reflecting the strengths in bilateral partnerships. 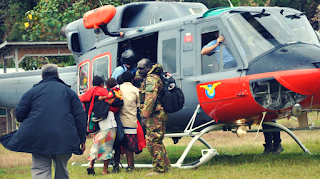 Mirisim said he saw the agreement as a big boost for the PNGDF. Mirisim acknowledged the NZ government’s assistance.